the exact release date I do not know yet. I would like to perform some deeper testing. So if there are any willing beta-testers just pm me or send an e-mail. Necesito hacer una consulta en espaÃ±ol. tengo discos de 3 1/2 con canciones y quiero pasarlos a midi con mi pc. Tengo sistema operativo xp. Â¿se puede hacer con el smfw30? Â¿CÃ³mo se hace? I have questions in Spanish. I have disks 3 1 / 2 songs and I pass it to midi with my pc. I have XP operating system. Can you do with the smfw30? How do you do? 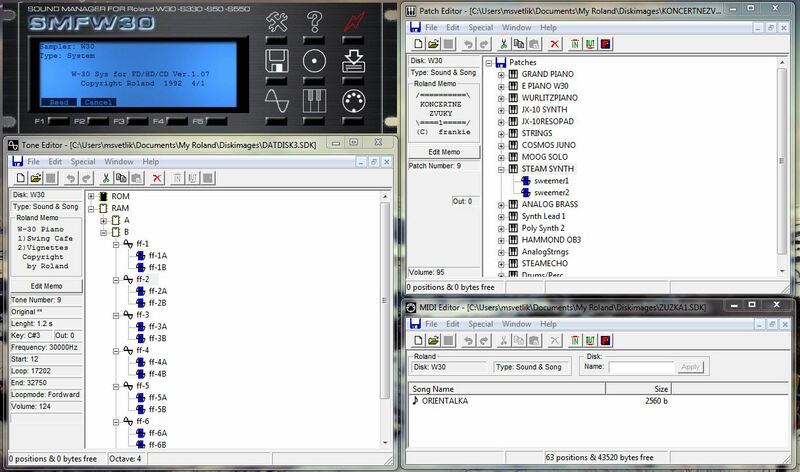 well SMFW30 can export and import MIDI files. Please follow my small how-to in new http://smfw30.svetlik.be/forum/index.php/topic,153.0.html section of this forum. Wow! Looking forward to this. You are including some great features. Thanks!! all the best in New Year 2011 to everybody! I am back from vacation (it was great by the way) and I would like to show off some progress . Patch editor is shaping nicely, displaying and saving of basic patches is already working. Some small issues in Tone Editor has been fixed as well. Here is the screenshot of my current build. This looks fantastic!! Looking forward to checking it out Miro. Well done!